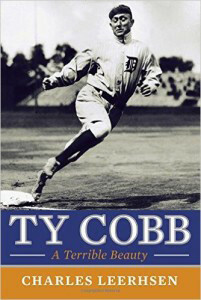 September 28, 2015 – Even casual baseball fans can name the game’s greatest heroes, and its most infamous villain: Ty Cobb. Yes, it’s something that even Yankees and Red Sox fans can agree on: “The Georgia Peach” wasn’t a very nice fellow. But what if everyone is wrong? What if, like Ulysses S. Grant, Ty Cobb’s enemies were just more prolific writers than his friends? What if by accepting the view of Ty Cobb as a belligerent racist and dirty player, we’re smearing baseball’s all-time great, and abetting a century of shoddy reporting? If so, then someone should set the historical record straight. Well, that’s exactly what Charles Leerhsen set out to do in his New York Times best-seller, Ty Cobb: A Terrible Beauty . In it, Mr. Leerhsen questioned all the accepted truths about Cobb and found the facts striking out. And Mr. Leerhsen is not just a sports fan, but a journalist trained in facts. You’ve seen his work everywhere from Sports Illustrated and Esquire to The New York Times Magazine and People. He has also been an editor at SI, Us Weekly, and Newsweek. You can find him @CharlesLeerhsen on Twitter and at CharlesLeerhsen.com. We hope you’ll pour yourself a cold one, tear open a box of Cracker Jacks, and play ball with Charles Leerhsen and Ty Cobb … A Terrible Beauty.